So the Justice League movie is set to come out this coming weekend, and I'm trying to be cautiously optimistic. With the exception of Wonder Woman (glorious Wonder Woman)(lesson ideas here) the DC Comics movies have been pretty terrible since Man of Steel came out in 2013. In my humble opinion, the biggest part of the problem has been the "vision" of Man of Steel/Batman V Superman/Justice League director Zack Snyder. He's missing the warmth, the fun, the color that's at the heart of these characters. Anyone who can make frigging Superman a dour hero doesn't have any business making Superman movies. But then came Wonder Woman. And then came Joss Whedon, taking over directorial (and writing, and re-shooting) duties late in the production of the Justice League movie. I'm hoping that Whedon, who created Buffy the Vampire Slayer and directed the first two Avengers movies, can bring some hope and light and humor, even though he did come to the movie late in the game. Oh yeah, LEGO. My LEGO Set of the Month is Battle of Atlantis. Honestly for the simple reason that I love Aquaman. I might write a whole blog post or chapter or epic opera about all of my reasons for loving Aquaman, but I do. Whether we're talking classic fuddy-duddy I've-Been-Wearing-This-Orange-Shirt-Since-1941 Aquaman (my personal favorite, I grew up with him on Superfriends)(and I've cosplayed as him a few times over the years), 1990s Piranhas-Ate-My-Hand-And-It's-Been-Replaced-With-A-Harpoon Aquaman, or now Jason Momoa Wow-They-Badassed-Him-Right-Up Aquaman, he's a favorite of mine. So the LEGO set with Aquaman is my Set of the Month. If you're interested in winning the set, check out how to do it below. 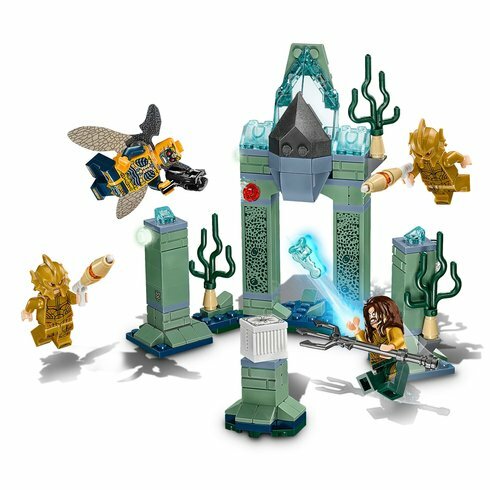 The Battle of Atlantis set is small, but has some things going for it that are pretty cool. 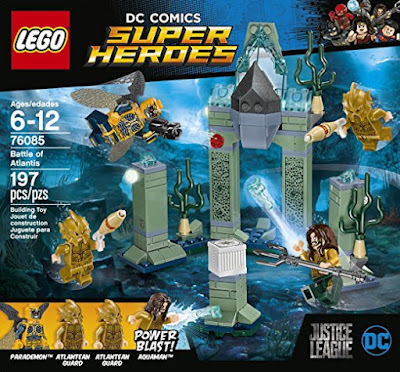 The minifigure selection is impressive for a set this size, naturally featuring Aquaman at the heart of things. The likeness to Jason Momoa is good, with a two-sided head that has a pretty neutral face and normal eyes--then turn it around and he's got a fierce grimace and his glowing superpowery eyes, I guess. He's not wearing the orange and green, but a gold and green that looks like intricate metallic armor--he got an upgrade for the big screen, and it's probably for the best. There are two Atlantean (from Atlantis, not Atlanta) soldiers with sweet finned helmets and similar gold armor -- and then there's a Parademon attacking Atlantis. The Parademons are winged monster soldiers from Apokolips, home of Darkseid. The storyline (sigh) involves one of Darkseid's lieutenants, Steppenwolf, leading an invasion of Earth, making way for Darkseid himself to come someday and finishing the subjugation of the planet. But the Justice League will repel this invasion by becoming a team and winning the day. I have so many issues with that storyline you guys. So. Many. Issues. If you ever want to have a prolonged conversation about all of the many things wrong with it (you don't), just say the word. The scene takes place among the pillars and arches of Atlantis, which look like they may be carved from coral (?) with some seaweed here and there, some barnacles, and even a few glow-in-the-dark pearls. There are a few pieces designed to break apart when attacked, that can be reset easily. The pinnacle of the archway is this cool transparent blue piece that topples nicely, but brings an air (a water?) of elegance and royalty to the set. Another part of the storyline involves "Motherboxes" that are like beacons to Apokolips; they're scattered across the globe and one happens to be in Atlantis--that's the white cube on the plinth wow I know the word plinth I hope it means what I think it does at the bottom center. It's a cool set. Not perfect, but it does what it should. Sets the stage, allows for some adventure, fires up the imagination. I'm sending one set, but if someone was obsessed enough to buy say, four of them, you could build a pretty extensive Atlantis and then have an Army of Atlantis and like four Parademons which is more of a threat, and then have an Aquaman for the set, but also a display shelf and also your desk at school and also your pocket JUST IN CASE. Yeah, that would be prettttty obsessed. Kids and adults, so humans, I guess, love the story of Atlantis. Whether it's a civilization that sunk millennia ago, or one that grew up with fish people underwater, or it leaked through from another dimension (the DC Comics version is some combination of these things), it's a place that's been part of Western memory and myth and pop culture for thousands of years. It's going to be featured in Justice League and then be at the center of the Aquaman movie coming next year -- but I don't know if it looks like "Atlantis" looks in my own imagination. Have students design their own vision of Atlantis, whether on paper or out of LEGO or other building materials. You could have students write a short story about a visitor coming to Atlantis for the first time, marveling at the world around them, and the things they'll encounter there. Are they welcomed as a hero, are they captured and brought before the king as an enemy, are they in a stealthsuit so they can't be seen, and observing as an anthroichthyologist, or is the civilization long dead, and they're an aquarchaeologist looking at the ruins? Students could compare and contrast Plato's version of Atlantis with the one pictured here -- could they be the same civilization? They could watch a clip of the heroes visiting the Disney version of Atlantis and compare it with this one too -- would the Justice League Atlantis fit in with that one, or are they too distinct to share the same world? Atlantis can be the key to a student's imagination. Help them unlock that door. SO HOW DO I ENTER TO WIN THIS AMAZING SET?? 1. Comment on this post. You do that below at the very end of this post. Lower...lower...there. 2. Subscribe to the monthly Play Like a PIRATE newsletter. It comes out once a month, with ideas for the classroom, a graphic novel review, and a review and chance to win the new LEGO Set of the Month. No spamming (beyond once a month), no selling your emails to anyone. I don't even know who I would sell them to. It may be worth investigating. 3. Follow @jedikermit on Twitter and retweet this tweet. If you're not on The Twitter, you really should be. Sign up just for this entry. And follow me. So worth it. You can follow the #PlayLAP hashtag to see what other people are doing with Play Like a PIRATE. A book you should totally buy. So you can enter up to three times. Don't try and cheat. Teachers always know. Some fine print: the LEGO Set of the Month will only be available to U.S. residents. Even though I love everyone on the planet, international shipping is beyond my reach. The drawing for the November LEGO Set of the Month will be at 9 PM MST on Wednesday, November 15. The drawing will be taken from all eligible entries with a random generator. So hopefully you win. Yeah, you.